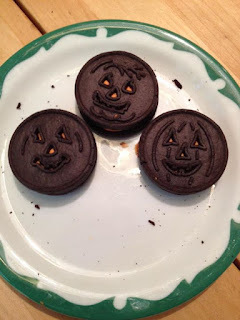 The Horror Movie BBQ: The Halloween Cookie Challenge! Well, allright! Finally! I've been waiting a good year or so to do this. See, last year I had a lot of medical issues including back surgery so most if not all blog projects I had planned had to be halted. One of those projects I really wanted to do was what I'm presenting today. So, I hope you enjoy! Also left in the dust was Wegmans cookie, only because there was nothing new about them. The design is the same as the cookies they offer every year, so for that reason, they come in last. It's like they put no effort out on this one. 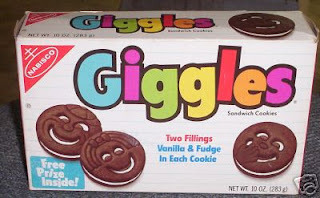 So, while Oreo puts up a great fight, making me think of Giggles was what sent JoeJoes over the top. Once again, you'd expect the Big O to win this one, but sadly it winds up second place again, this time to Wegman's O's . JoeJoes had to sit out this round. The cream, while tasty and probably much healthier, just fell flat, taste wise. 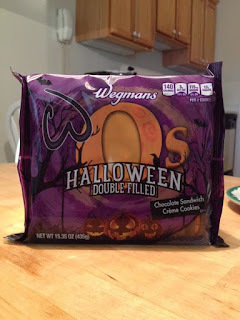 Wegman's O's provides a little bit creamier and smoother. 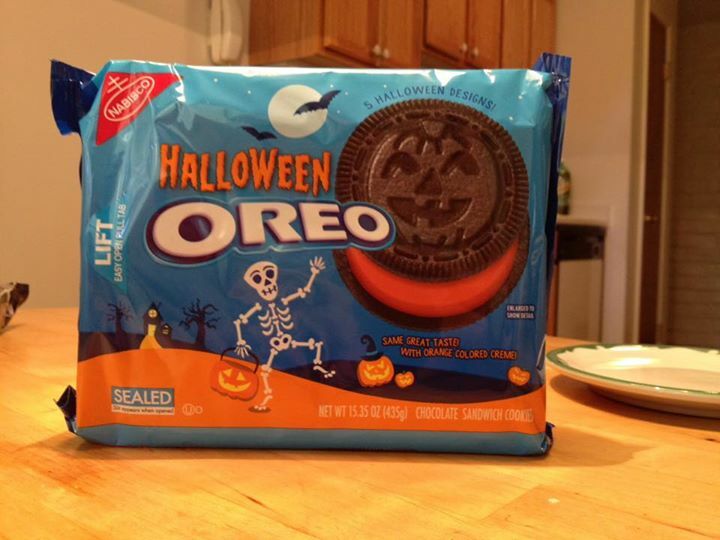 Oreo didn't really change it's recipe, and the cream just slides off the cookie if you pick at it. Not Wegman's O's! The consistency is more of actual cream. I'd believe it to be the real deal. As you've guessed, I put them in order of the winners. 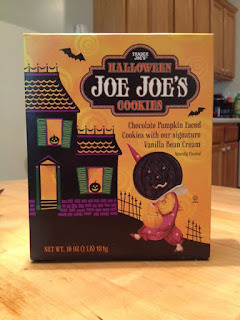 Trader Joe's always goes above and beyond with their packaging and putting them in a box itself instead of a resealable bag gave them a rather smart advantage(and maybe a little unfair). 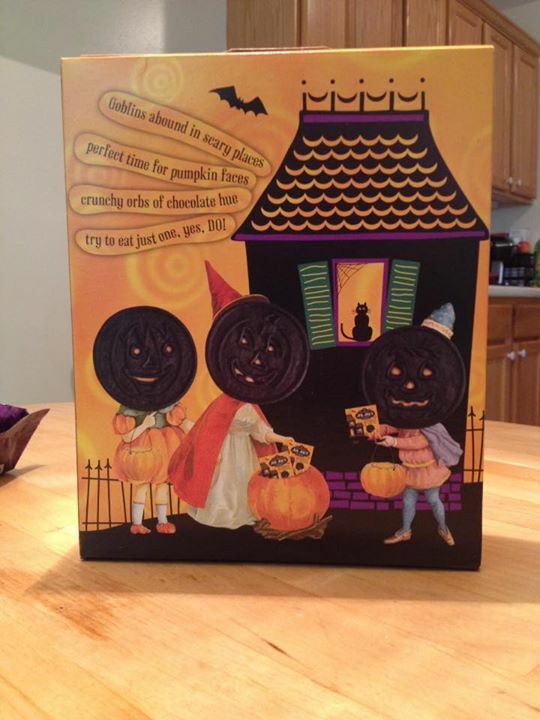 Not only is the front adorned with trick or treating cookies, but so is the back. I'd say that alone brings JoeJoes back to first place. Wegmans, has a very colorful design as well. The purple and orange just jump right out and demand your attention. If this was just Wegmans vs Oreo, the big W would've taken this one. 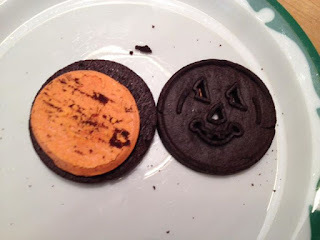 Oreo, while very festive and cheery, lost. But not in vain. The happy skeleton and bats and orange brick road made it hard for me to put it in third place. But, that's the price for being unbiased. Yup. As you can see, Ax and Smash are ready for the challenge. And if there's any category that Demolition is most well versed in, it's dunking cookies. Let's put it out there: who's going to know more about scary looking cookies than a bunch of 40 year old men in face paint and assless chaps? So by now, Oreo has been lagging and I feel a little sad for it. But I still have to remain biased. Remember when I said Wegmans had the best cream? 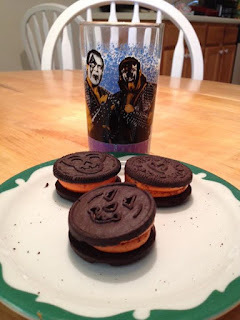 Well,t hey apparently also had the best cookie for dunking as well. I'm sure that's a huge blow in the face of America's favorite cookie. Dejected, but not out, Oreo would wait. 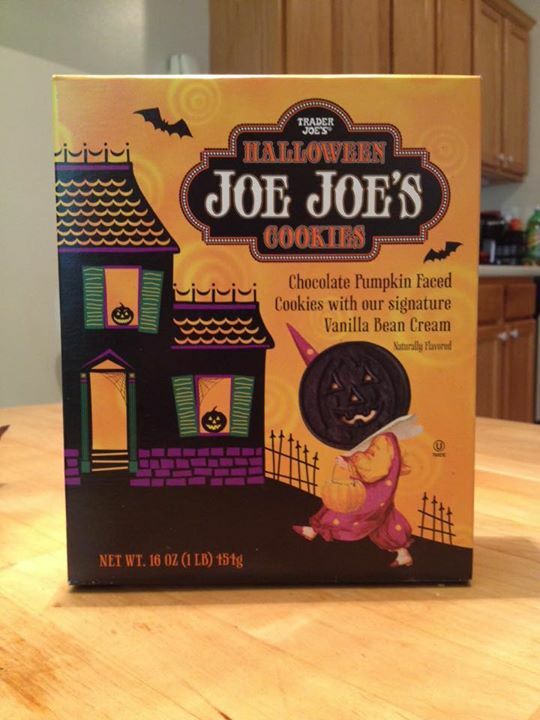 JoeJoe's weren't that terrible, but the problem with dunking them was that the cookie itself gets very crumbly and seperates very easily. 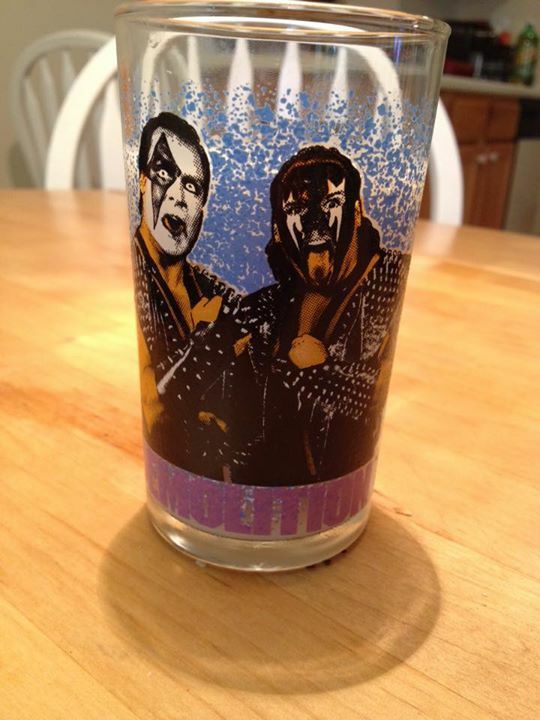 Much like myself, Demolition was NOT impressed or pleased with this behavior on the part of Joe. 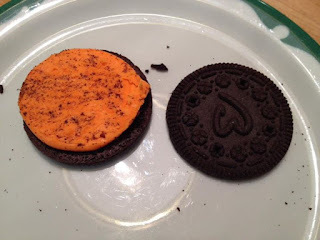 The fact that a cookie fell into the milk itself upon initial dunking gave JoeJoe's a giant red X. Hold on, I can do better than that. Well, that wasn't as tacky as I thought it would be. Not nearly as large either. Oh well. Man, Oreo is really suffering here. But good news for them, this is their category to win. 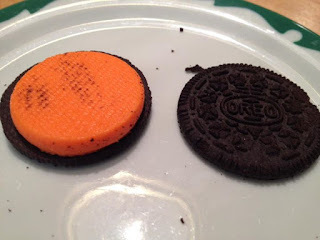 They practically invented the double stuff! They have everything to gain and nothing to lose, right? 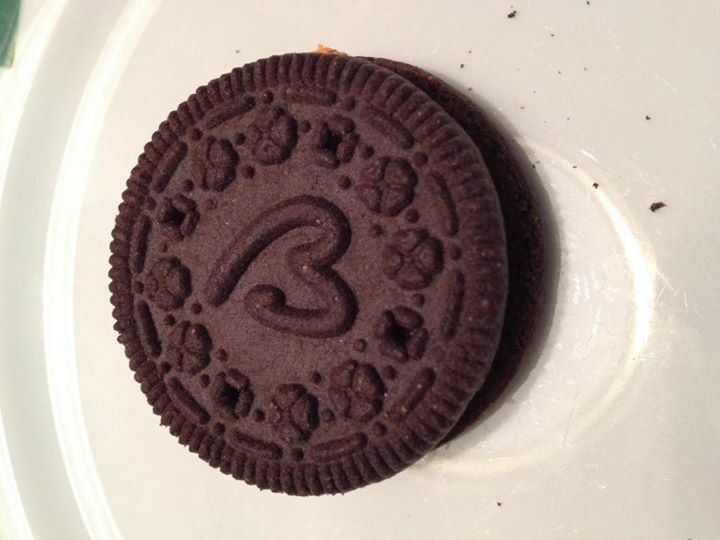 The fact that Oreo's cream is kinda fat helps it big time. It towers over the others and stacks perfectly. 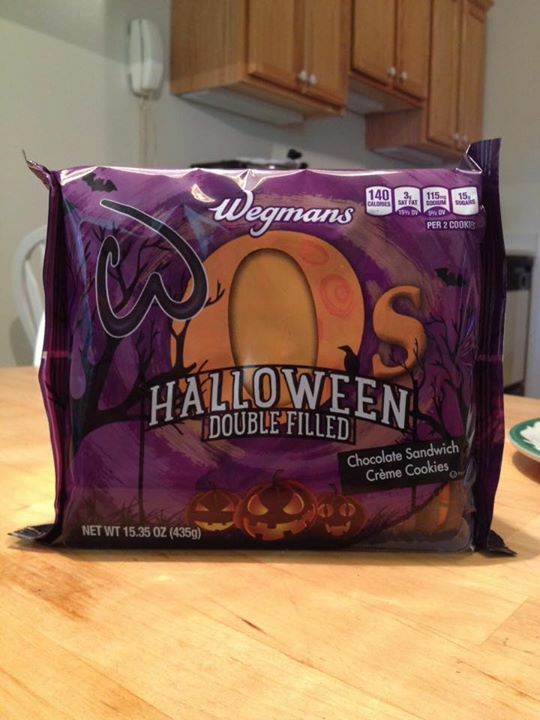 Whereas Wegmans O's and Trader Joes just kinda slouch and become uneven. So, in this battle, congrats Oreo, you win. DING DING DING. LADIES AND GENTLEMEN. 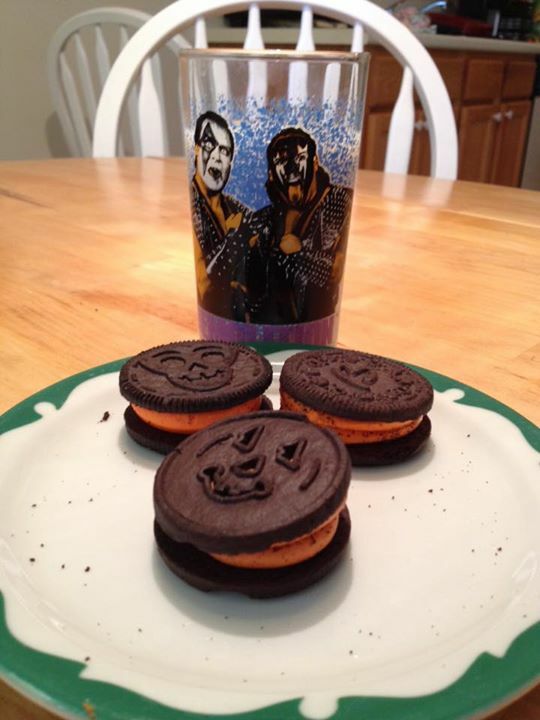 YOUR WINNER AND....NEW HALLOWEEN COOKIE CHAMPION...HALLOWEEEEEEEEEEEN OOOOOOOO'S! It was a very hard fought battle, but while Trader Joe's and Wegman's were tied in points, Wegman's O's took the victory in overall taste. A stunning upset. 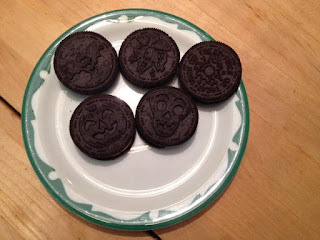 I was really expecting, much like you, for Oreo to take the golden crown. But who knows, maybe their Christmas cookie offerings will put them back in the running. Sorry. That's the only time that it's appropriate to use. Now, obviously this is all just my opinion. I get the sense you'll have a difference in opinion. Please share with me your thoughts. 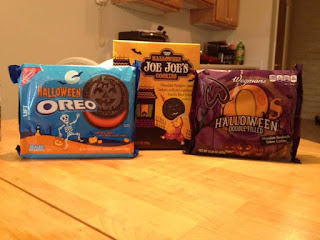 And if you don't have a Wegmans or Trader Joes near you, maybe suggest a new cookie that you feel will be a better King of Halloween Cookie!